Vi bruger dem som billeder der illustrerer rækkefølgen af en vekselvirkning mellem partikler (kollision, spredning, henfald) i rum-tids diagrammer. These cosmic ray muons have a lifetime of 1/500 of a millisecond before they decay. 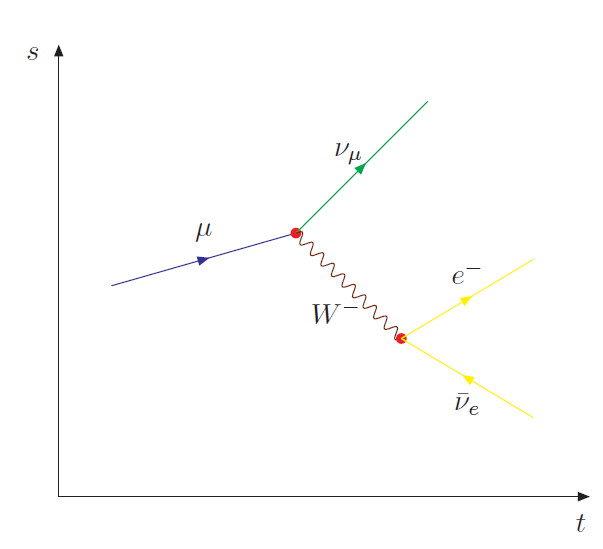 In this picture you can find the Feynman diagram describing this decay of the muon into a W- particle and a muon neutrino. The W- itself decays into an electron and an electron anti-neutrino. You can gather the chronological sequence from the horizontal axis (time, abbreviated with t) in this diagram. The spatial sequence can be gathered from the perpendicular axis (s for space). There are always ingoing particles (here: muon) and outgoing particles (here: neutrinos and electron) inside a Feynman diagram. 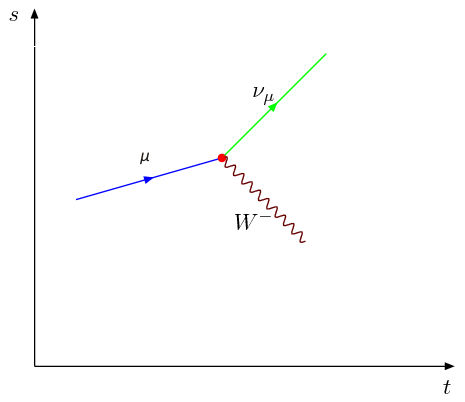 Leptons are displayed as straight lines with a little arrow in the middle of the line whereas the messenger particles of the weak (W, Z) and electromagnetic (γ) interactions are shown by wavy lines. 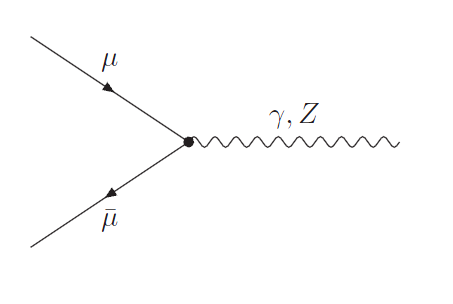 Anti-leptons are always displayed with an arrow that points backward in time. Interactions are described by vertices (here: red coloured). They also mark places where charge, momentum and energy conservation must be valid. The first vertex represents the process that happens earlier. There a W- particle is emitted. This is called emission of a messenger particle. The second vertex shows the creation of particles. 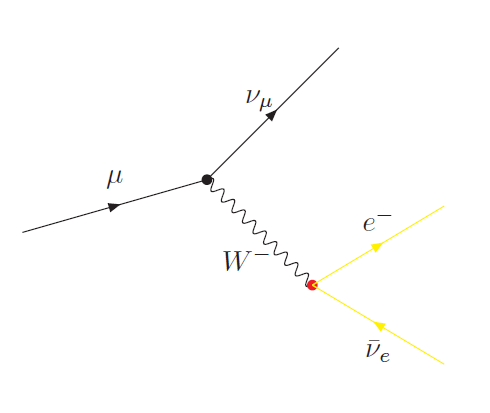 Here, the W particle is transformed into an electron and an electron anti-neutrino. And what if by chance a muon hits an anti-muon during its flight through the earth's atmosphere? They both annihilate, destroy each other, and create either a photon or a Z particle. This process is called annihilation. Faktisk er Feynman diagrammer (opkaldt efter Richard Feynman) billedlige beskrivelser af bidrag fra vekselvirkninger mellem partikler, som beskrives af kvantefeltteori. Ved at bruge disse billeder kan man illustrere komplicerede processer og lettere beregne sandsynligheden for at de forekommer. Her kommer du tilbage til siden om Z partiklen.